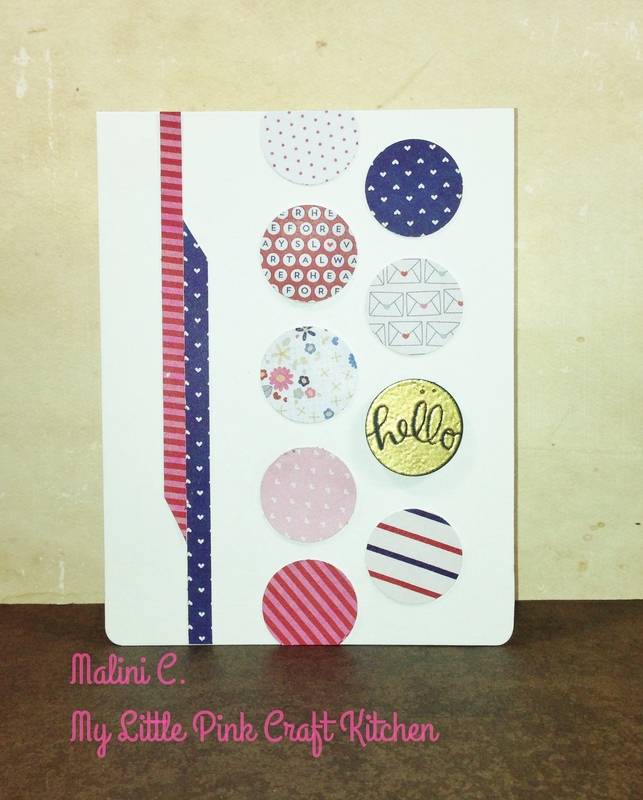 Posted in Card Blog	by Malini C.
Hi everyone! 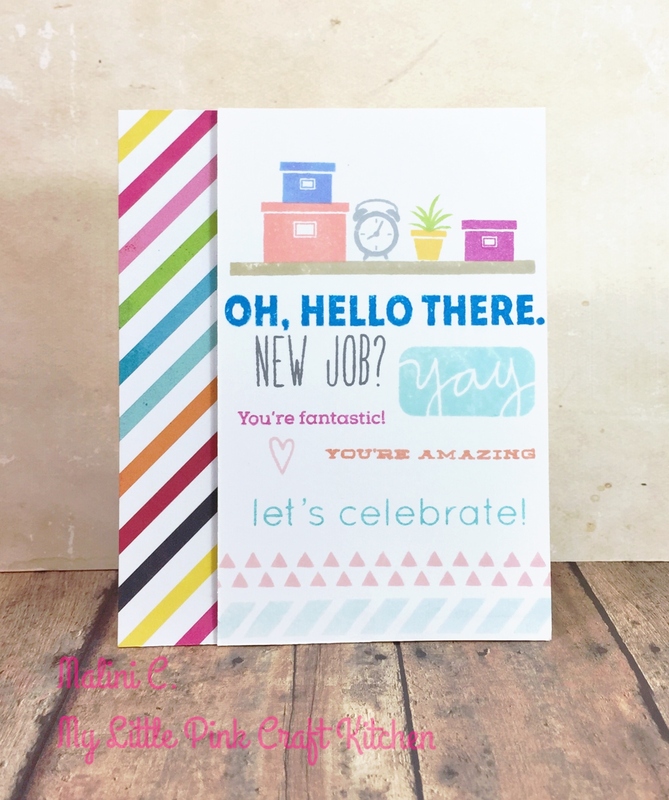 I’m here today with a card I made for a friend who landed a new job recently. I wasn’t sure how I was going to make this card since I really didn’t have any job related stamps. As I was looking through my stamps, the To Thine Own Shelf stamp from Simon Says Stamp really stood out with some images I could use. So I started with that and the idea just went in different directions from there. 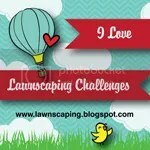 I also used other stamp sets from Simon Says Stamp and Lawn Fawn. I started this card with a standard card base with the fold on top from some Simon Says Stamp 120 lb white card stock. I stamped the images related to a workplace from the To Thine Own Shelf set and and I also stamped some sentiments from there and from other SSS sets. For the word “new job”, I didn’t have any so I used Lawn Fawn’s Milo’s ABC which is my favorite alphabet stamp ever. I stamped all images ans sentiments with a variety of ink colors. I wanted the card to be one layer but I later decided to put a strip of patterned paper from Simple Stories on the side. That’s it for this card. 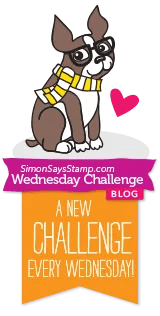 This card is an entry for the Simon Says Stamp Wednesday Challenge. The theme for this week is Anything Goes. For a complete list of all the tools and products I used, please check the supply list below. Hi everyone! I’m here today with a card for a friend of mine who loves ice cream. She is celebrating her birthday soon and I thought it was a great idea to give her an ice cream card. I started this card with a standard size card with the fold on top from Neenah Solar White card stock. I selected a rainbow paper from Bo Bunny’s Lemonade Stand 6×6 paper pack and adhered it flush on to the base covering the entire front panel. 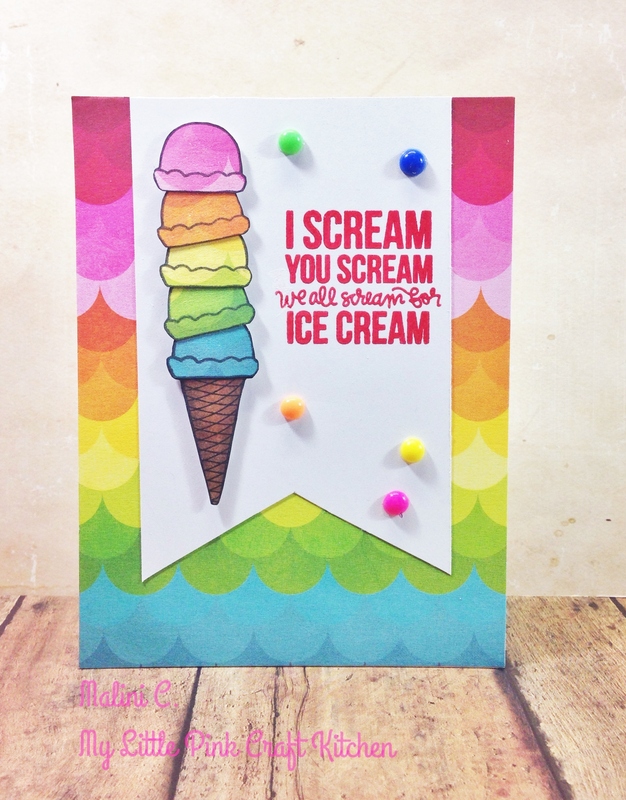 I used the left over rainbow paper and stamped scoops of ice cream from the Ice Dream stamp set on the different colors of the paper and fussy cut each one. I also stamped the cone and colored it in with Copic Markers. I arranged the scoops in rainbow order and stuck them to each other to look like they were stacked. I attached the entire ice cream cone on a piece of Neenah Solar White card stock cut with a flag banner. 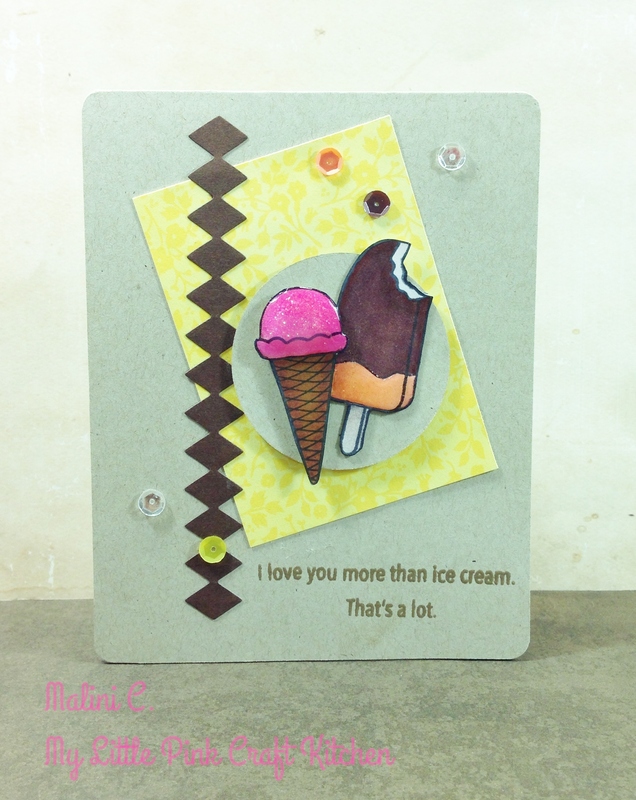 For the sentiment, I stamped the “I Scream” message from the same Ice Dream set in Memento Luxe Love Letter ink. For a glossy finish, I heat embossed it with clear embossing powder (my current favorite technique). To finish the card, I attached the flag banner on the card base. I also added some DIY enamel dots I made from perler beads. That’s it for this card. For a list of all the products and tools I used, please refer to the supply list below. I made this card a while back but failed to post it earlier so I decided to post it today. 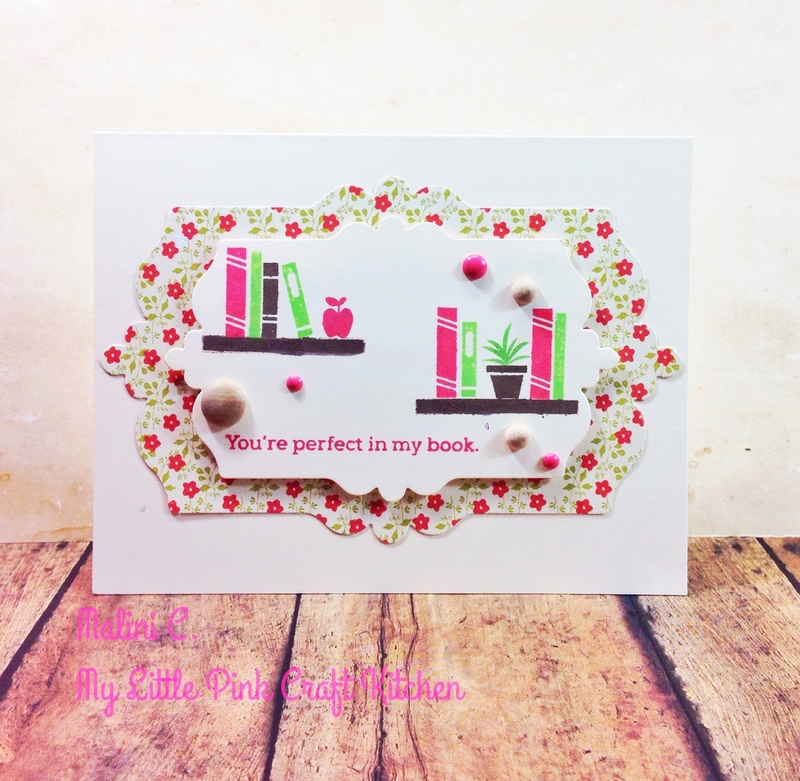 This card uses the supplies from the Simon Says Stamp October Card Kit. I started this card with a standard size card cut from Neenah Classic Cream card stock with the fold on top. I adhered a piece of patterned paper with the same size from Basic Grey’s Grand Bazaar 6×6 paper pad. For the top panel, I cut a 4 1/2 x 3 1/4 panel from the same Neenah Classic Cream card stock. I stamped the small coffee mug from the What’s Brewing set towards the right of the panel like they were stacked using the masking technique. 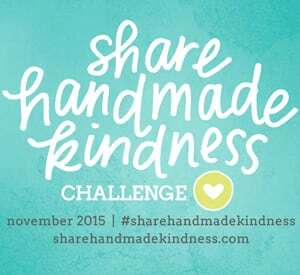 I stamped it in a variety of inks from Simon Says Stamp which will be listed below in my supply list. For the sentiment, I used the stamp from the same What’s Brewing set and stamped it vertically with Doll Pink ink from Simon Says Stamp. To finish the card, I adhered some enamel dots from My Mind’s Eye and attached the panel on the card base using foam tape. For a complete list of all the tools and products I used, please refer to the supply list below. That’s it for this card. Thanks for reading. Hi everyone! 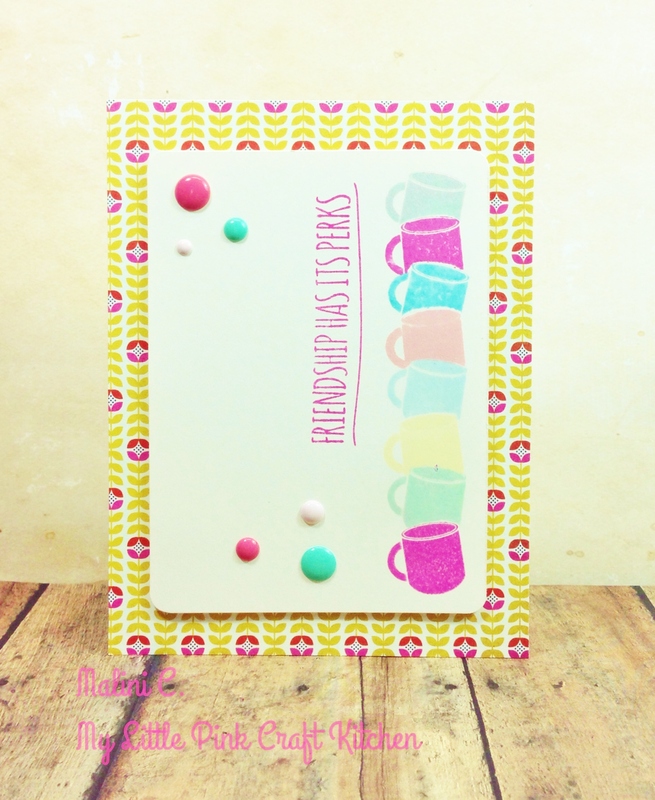 I’m here with a card using supplies from the Simon Says Stamp September 2014 card kit. 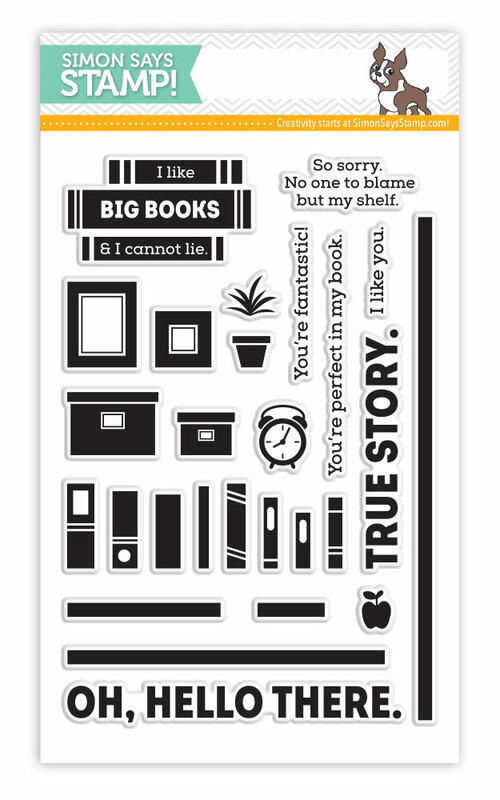 This kit has a book/reading theme. You can create shelves or a stack of books or really anything outside the box if you just imagine the possibilities. Today I wanted to create a more safe card aligning with the theme of books. I started this card with some Neenah Classic Creme card stock from the kit cut to a standard size landscape card. For the patterned paper piece ton top, I used papers from October Afternoon included in the kit and cut it with the Sizzix Fancy Labels #3. I also used the same Sizzix label die set but a smaller one to cut from the same Neenah cream paper to be nested on top of the patterned paper. On the smaller label piece, I stamped the ledge/shelf with Cup O’Joe ink from Hero Arts. For the books, apple and plant, I stamped them in Cup O’Joe. Pale Tomato and Green Hills ink to match the patterned paper. For the sentiment, I used one from the set and stamped it with Pale Tomato ink from Hero Arts. To finish the card, I used the woods dots from Teresa Collins and some pink enamel dots from My Mind’s Eye. Then I adhered the panel with some foam tape for added dimension. This card is an entry for the Simon Says Stamp Wednesday Challenge. 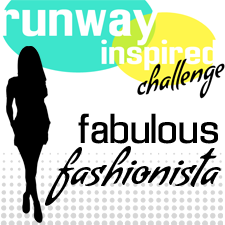 The theme for the challenge is Anything Goes. For a list of all the products I used, please check the supply list below. Hi everyone! Im here today with a card for the RetroSketches Challenge using supplies from the Simon Says Stamp August Card Kit. I started this card with some Neenah dessert Storm card stock cut to a standard size with the fold on top. I cut a piece of patterned paper from Bo Bunny that was included in the kit. I attached it to the front of the card tilted. For the diamond, I cut a die border from Sizzix on some brown paper. For the focal point, I cut a circle from the Sizzix Circle Framelits and attached the variety of ice cream. I colored the sweet treats using Spectrum Noir markers. I attached the circle to the center of the card. For the sentiment, I heat embossed on gold embossing powder. To finish the card, I added some sequins from Pretty Pink Posh and added glitter accents to the ice cream. That’s it for this this card. Thanks for reading. Hi everyone. Today’s card is another share from the SSS July 2014 card kit. I’ve really had a lot of fun with this kit and I am very excited to move on to the August kit. 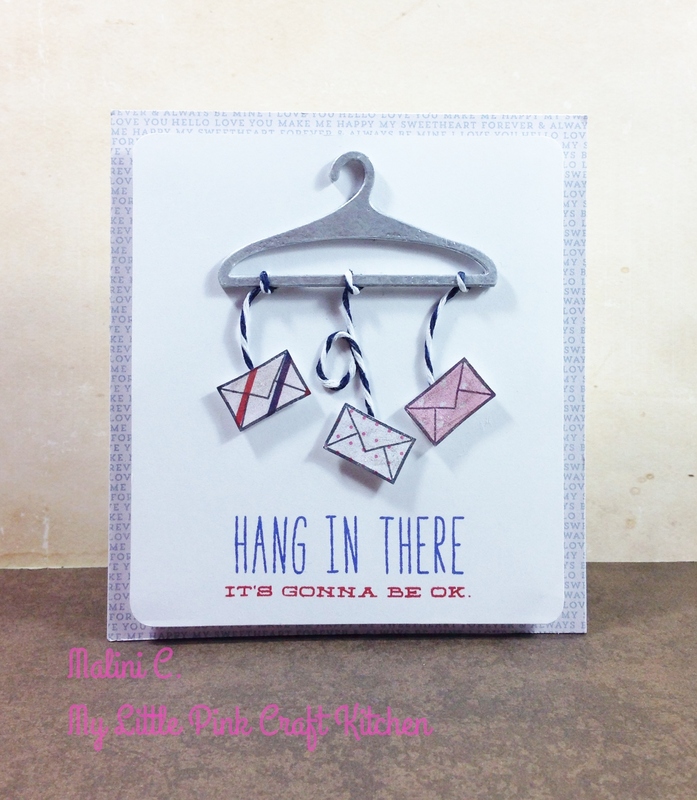 This card is an entry for the Simon Says Stamp Wednesday Challenge. 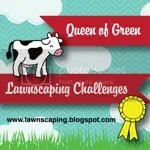 The challenge for this week is ANYTHING GOES. 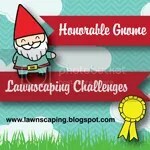 This is also an entry for A Blog Named Hero‘s most recent challenge. The challenge theme is Die A Little. I started this card with 4 3/4 by 4 1/4 card from Neenah Solar White card stock. I adhered a piece of patterned paper from Pink Paislee over the entire front of the card. The front panel, I cut a piece measuring 1/4 x 3 3/4 from more Neenah Solar White card stock. I die cut a few pieces of the hanger die cut from the Thanks For Your Support coordinating die set from SSS. I stuck each hanger together and for the top most piece, I covered it in VersaMark and heat embossed it with silver embossing powder for American Crafts. That made it look like a steel/metal hanger which was the look I was going for. For the envelopes, I stamped the smallest envelope from the Happy Thoughts stamp set on different patterns from Pink Paislee. I attached the envelopes on the hanger with blue twine from Maya Road. For the sentiment, I used Milo’s ABC from Lawn Fawn in Memento Paris Dusk ink and a sentiment from the Love This set using Lipstick Red ink. I rounded the corners of the front panel and adhered it with foam tape. That’s it for this card. For a list of the tools and supplies I used on the card, please check the supply list below. Hi everyone! 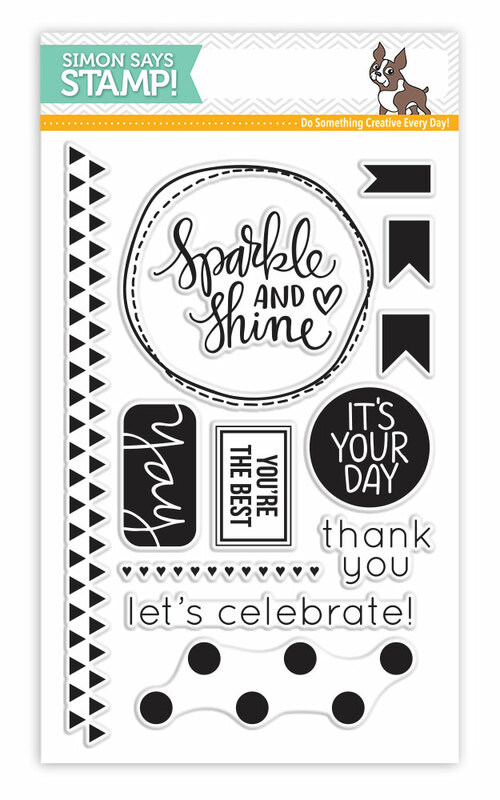 I’m here today to share a few cards that I made with the Simon Says Stamp July 2014 Card Kit. I made a total of 11 cards for this kit. I already shared 3 and I will share another 3 today. I have a 7th card that I will share tomorrow. As for the balance 4 cards, they were mostly inspirations from the inspiration sheet we received with the card kit so I won’t be sharing those anymore since they were mostly CASE cards. The Simon Says Stamp Card Kit is an awesome deal. It is a monthly subscription of card making supplies with a theme each month. To purchase each kit is 24.95 on its own. If you decide to subscribe it will be 19.95 which is reasonable price since you are getting a full size stamp set every month. I love receiving the kit each month because it definitely helps kick start my creativity. I started this card with a standard size Neenah Solar White card stock with the fold on top. For the chevron design, I am using my favorite technique which Jennifer McGuire demonstrated here. I love chevrons and when I saw Jennifer’s tutorial, I knew I would be doing this all the time. For the chevron pattern, I used the patterned papers from Pink Paislee that was included in the kit. Instead of using the chevron stripes as a whole sheet, I decided to cut each strip so I could place them randomly on the card. I ran the stripes on my Xyron Sticker Maker to make it easier to stick. For the sentiment, I used the sentiment from the stamp set included in the kit. I stamped it using Lipstick Red ink from SSS. I also randomly stamped some of the hearts around the sentiment the same red ink. To finish the card, I accented the hearts with some Clear Wink of Stella pen and locked the shine with some Glossy Accents. For this card, I was inspired by a card I saw at my local grocery store. I forgot to take a picture but it had stripes printed on the background so I knew I wanted to use strips of paper using the Pen Pal collection. I chose a few patterns and cut them into 1/4 inch strips. I started sticking the strips at the center and worked my way to each side. I decided to arrange them randomly with different heights. I used Neenah Desert Storm as my main card base. The card is standard size with the fold on top. For the main element, I cut a circle using the Sizzix Circle Framelits set from the same kraft card stock. I embellished it with the typewriter, heart and thought bubble puffy stickers from the Pen Pal collection from Pink Paislee. I started this card with some Neenah Solar White card stock cut to standard size card. Using the patterned papers, I cut 1 inch circles and adhered in 2 lines on the front of the card. For the sentiment, I used the round hello greeting from the same set. I embossed it on Blueberry card stock from Bazzill using the AC Zing Gold Metallic embossing powder. I stuck the other circles straight on to the card stock but for the Hello sentiment, I adhered it using foam squares for added dimension. I had some left over strips from the previous card, so I cut one side at a diagonal and adhered it to the card. To finish, I rounded the bottom corners. That’s it for this post and card kit. For more information on the tools and supplies I used for the cards, please check the supply list below.